I received some new studio lighting gear. That’s always cool isn’t it? But of course new lighting equipment needs to be tested. So I asked Thalita to help me out as a model during the test shoot. You may already know Thalita as the WAC Mechanic from my previous blog about her. Well, this shoot showed a completely different girl. Don’t get me wrong. In both ways she is very charming though. We started with a very dark lighting setup combined with a dark background with a nice pattern. In these shots the main attention is put on Thalia’s face. After that we changed the lighting setup. We replaced the dark background for a white one with the same pattern. Thalita wore a beautiful dress which actually lovely matched the ambiance of both backgrounds. 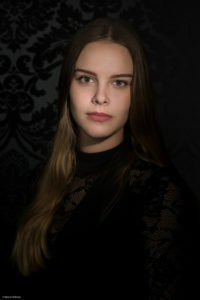 For the images with the dark background I used a small directional studio flash unit with a grid and a aperture mask which was pointed at her face. The dark parts of her body were slightly filled in with a studio flash with small octa softbox. At the background, another studio flash with a striplight (softbox) was used at a narrow angle to the background in order to accentuate the structure of it. The images with the white background were lighted with only one studio flash unit with a small octa softbox. So I think the first shoot with the new lighting gear succeeded very well. We have had some beautiful results. Thank you Thalita for helping me out during this shoot. You did a great job.